Canned pumpkin and chocolate candies are always purchased in abundance during the holidays. (What’s the point of a stocking if Santa doesn’t deliver chocolates?) Start the violins…luscious chocolates are the typical “leftovers” from the holidays at this Ninja Baker's home. Half cans of pumpkin puree used for pie are also left alone…until today. A challenge was issued from the Sunday Supper Movement: Transform holiday leftovers into divine dishes and desserts. Perhaps I could have made a Japanese okonomiyaki pancake with the pumpkin. But I prefer dessert. A chocolate one. So I skipped with my fingers over the computer keyboard to Cookies & Cups. (A magical cookie, chocolate and other kid-friendly food kingdom ruled by Shelly Jaronsky.) Sure enough, a pumpkin brownie recipe quickly appeared. I was encouraged to read that although the taste was slightly different, her children loved the brownies. Her recipe required only 2 ingredients. Wonderful, right? Yes. But, when I started mixing up the brownie mix and pumpkin, I got a bit nostalgic. After all, the holidays require cinnamon, allspice, ginger and ground cloves. Also, Christmas, New Year, any winter holiday in Japan is not complete without a Japanese mikan. (An American cutie orange.) Out came the zester. Two cutie Japanese orange skins were sprinkled into the mix. Basically, I had a chocolate/pumpkin spice brownie cake on my hands. (A bit like a Mexican brownie?) The cakey brownie begged for cream cheese frosting. I complied. With the leftover chocolate kisses I garnished the frosted brownies. P.s. I channeled my inner Liz Berg from That Skinny Chick Can Bake when cutting the brownies. Liz says to always cut cold brownies with a warm knife. And clean the blade between each slice. What foods make the holidays for you? Chocolate? Pumpkin? Love to hear! Feisty and festive spices are sprinkled into brownie batter. A healthy dose of pumpkin and Japanese orange zest brings another gift of deliciousness. 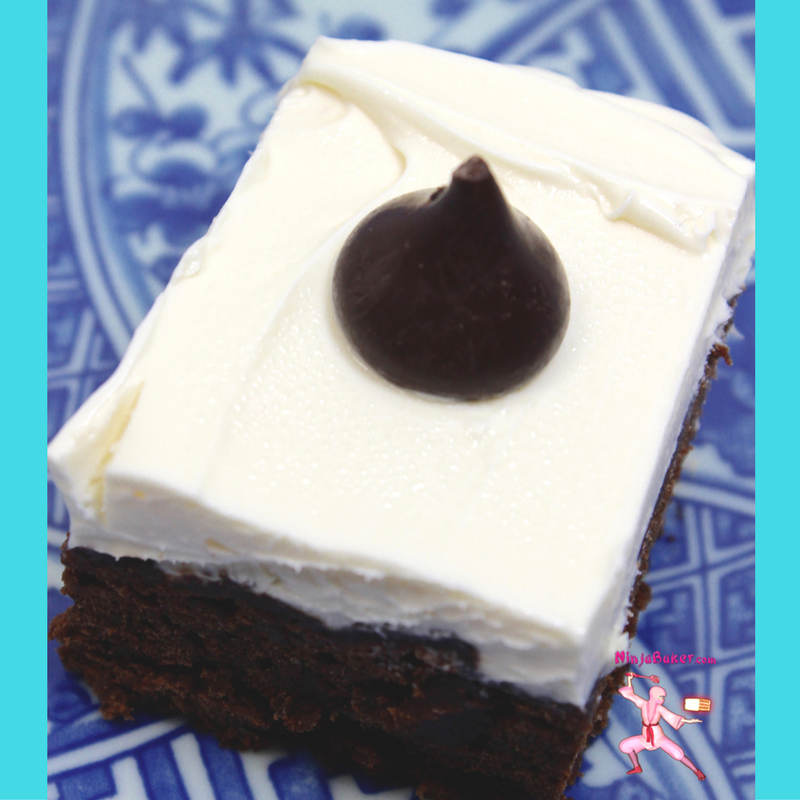 The cake-like brownie is perfect plain. But the cream cheese frosting and the dark chocolate garnish gives the impression that the holidays never ended. Inspired by a Cookies & Cups recipe. Line an 8” x 8” pan with aluminum foil. Coat generously with baking spray. Vigorously stir all the ingredients in a big bowl until well combined. Bake at 325° for 42~44 mins. Cool. Frost with cream cheese frosting. Garnish with chocolates. Christie from A Kitchen Hoor’s Adventure is hosting today's sumptuous feast of possibly the best leftovers you've ever had! Wishing you a holiday season filled with sugar, spice and everything nice.